Today's S.U.S. is another piece of perfection by Kay Brooke, otherwise known as little_bluestudio on Ebay. It is being modelled by Electropop Dynamite Girl Susie doll of Integrity Toys. 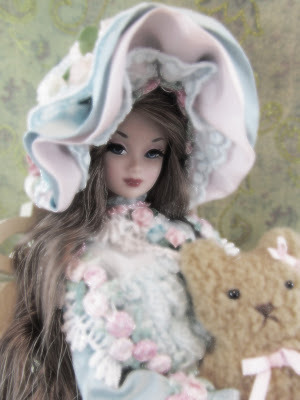 Antique French doll fashions are the inspiration for this Kay creation. A wonderful representation for sure. This is a greatly detailed attire that is certain to make the meticulous doll collector in you squeal in delight. This outfit is my second one by Kay. The first can be seen HERE. 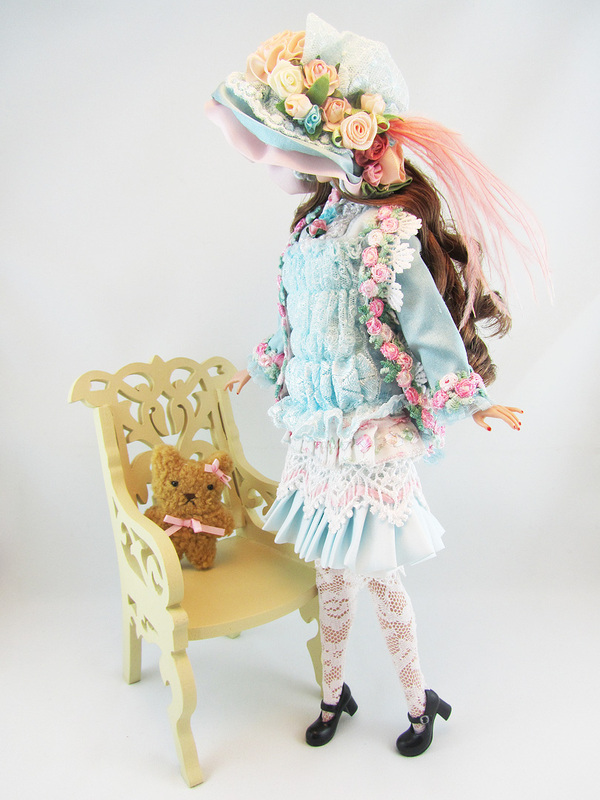 The bonnets alone that came with these two clothing sets are masterpieces. I'm not a very flowery type of gal myself but the intricate flower details on the headpiece, you can't help but appreciate! Of course, if the bonnet was wonderful, the rest is even more awesome. Who knew laces could be cool when they so often just remind me of doilies? Although those antique dolls freak me out a bit, I can't argue that they came in awfully cute attires. In the past I've wondered how such clothing would look on a modern fashion doll. Now Susie is modelling it for me....And in such a nice shade of blue too! What can I say? I Just LOVED! Where can I buy outfits like this? I have a project (didn't start yet) which is dress some of my dolls like this, in this antique fashion which is so marvelous and beautiful! But I still don't know where buy such cute outfits! It's amazing what kind of goods you can find on Ebay, Lady Lolo! 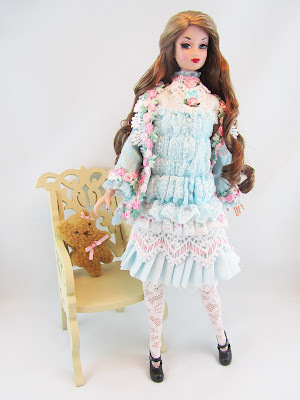 I stumbled upon Kay's doll clothing under her seller name, little_bluestudio. 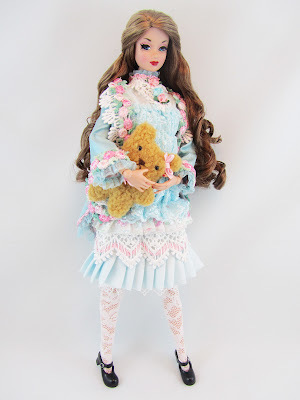 Once in a while she would have historically inspired doll clothes up for auction. Thank you very much! I found her! Hi! Thank you for your blog! Frankly speaking I have never read anything that interesting.